The weather forecast wasn’t looking good as we got on the road. The ride from Barre to northern Lake Champlain was short and warm. A bigger concern than the weather was blowing a tire on the hot pavement. The temperature was in the high 80’s and there was steady breeze with predicted severe thunder showers. At the time we launched the boat the sky was blue and only a few clouds on the horizon. The fishing started off slow. 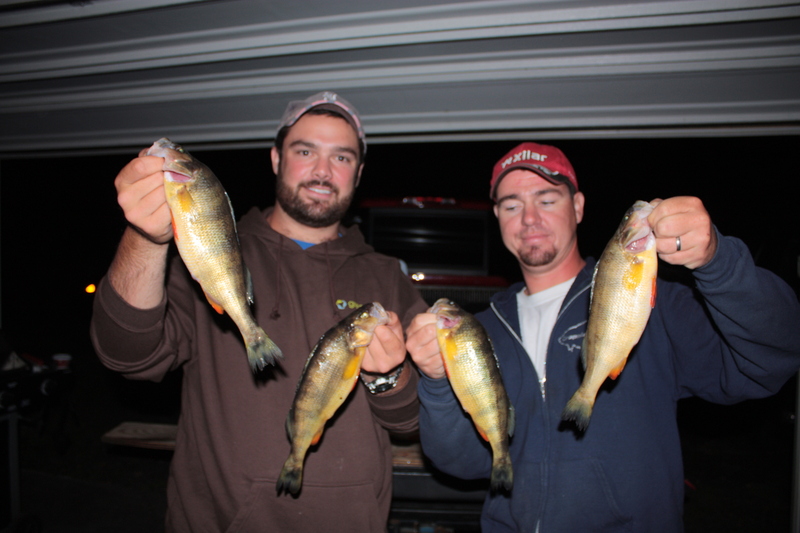 We were pitching to shallow docks and the shaded side of boats but were only able to hook up with pumpkinseed, bluegill, and a few smaller bass. As we fished our way through the maze of boats the wind kept us working to not make a bumper boat course. After a while with minimal results, we decided to make a big move. The spot we moved to started producing quick. 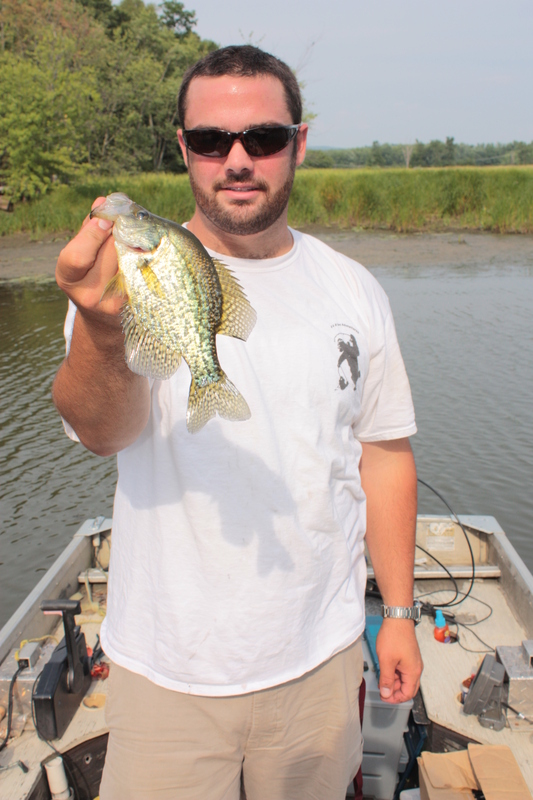 Mostly perch and bluegill but we managed a few decent crappie. 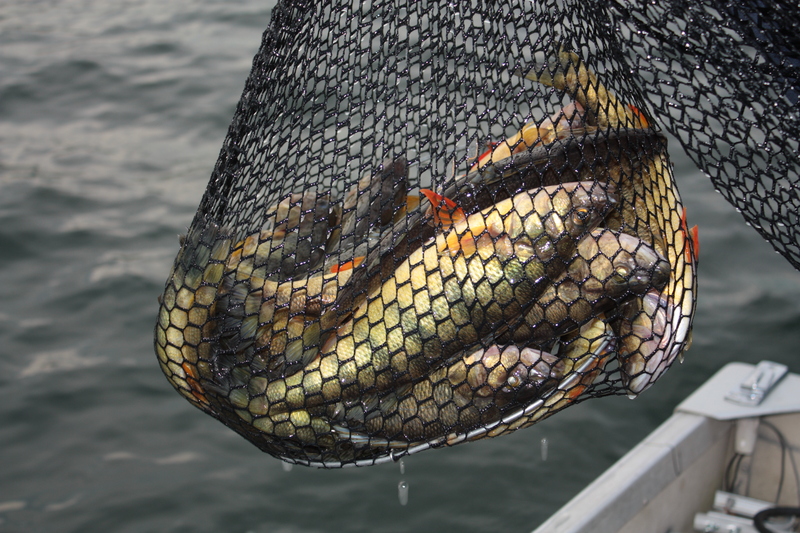 We found these fish stacked up under a few secluded boats and docks. At first we were tossing “Live” Baby Shad and the fish were biting. The only problem was many of the fish were small so hook ups were an issue. We made the switch to worms and that was the ticket. We started catching more fish everywhere we went. 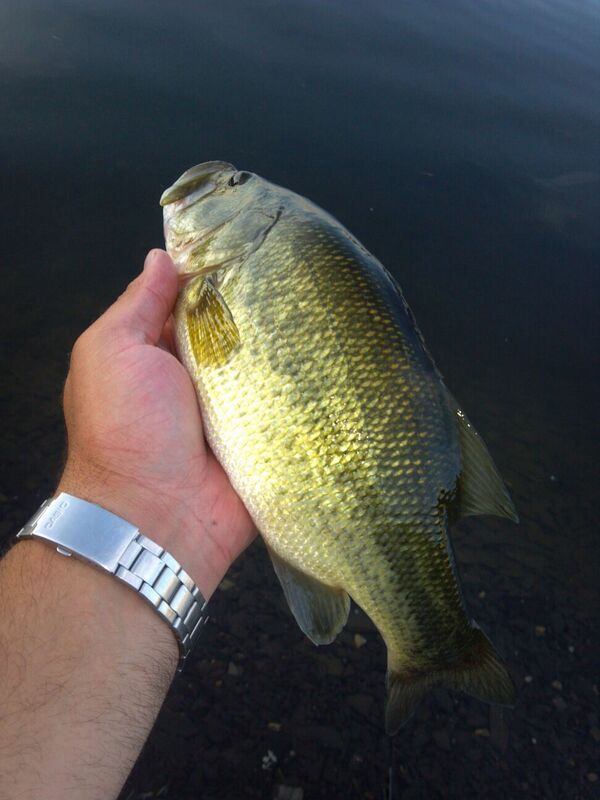 We got a call after a bit on the water that the fish were biting back at our original spot. As we started to head back the clouds let loose. Luckily we had the foresight to put our rain gear on and managed to stay mostly dry. We endured rain,hail, frequent lightening, and whitecaps. What a 2 mile trip in a small boat! How did we not see this coming right? After the clouds parted we were able to focus back on fishing. The bite was decent. 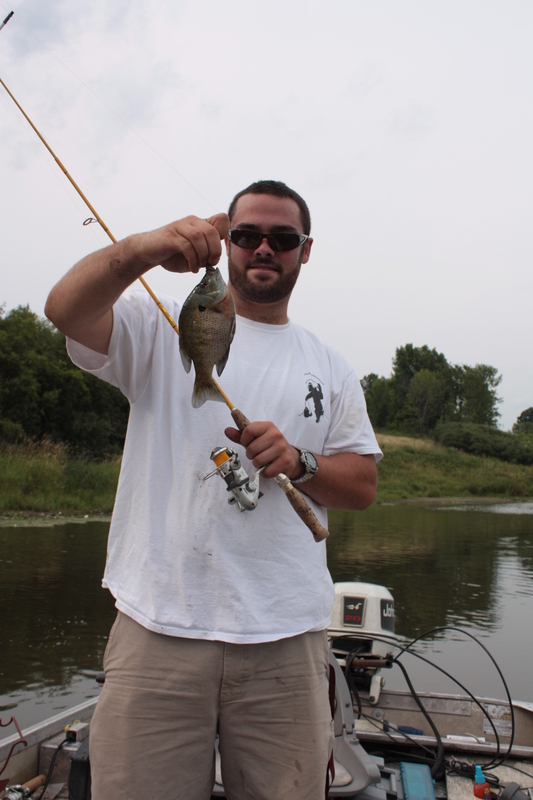 Just about every cast yielded fish but they were all bluegill and pumpkinseed. 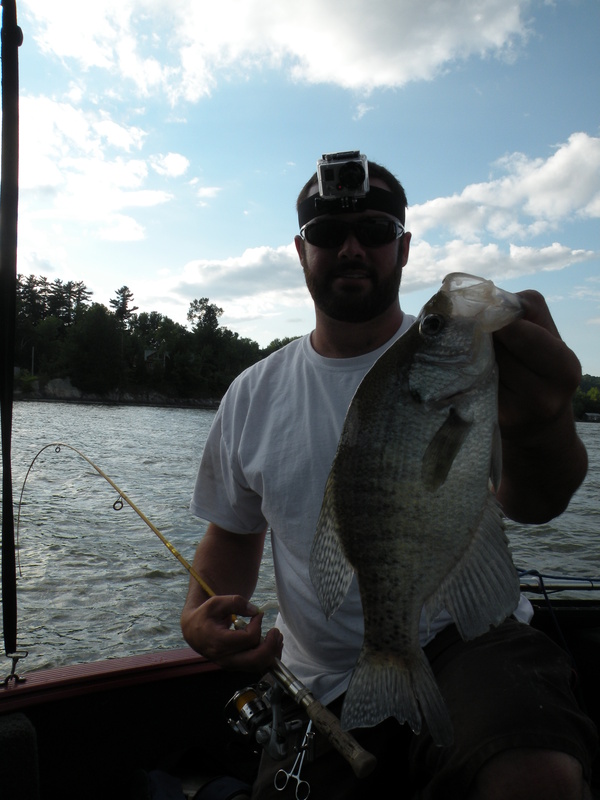 At one point we were vertical jigging and could see a while Lake Champlain sized school of sunfish. Pretty cool sight to see. About this time we got a call from a passerby saying that there was another storm coming that was going to produce a more violent passing than the first. It didn’t take much for us to pack up and head out. As we rounded the point to the boat launch the skies looked fine so we decided to fish a few more docks before loading up. These docks held a ton of fish. Some nice gills at that. We started off by casting to the docks but at the wind pushed us closer we were able to vertical jig them. The fish were biting at just about every depth in the water column. While the fish were biting good, the black cloud we saw approaching over the tree line was less than inviting. About the time we turned the final crank onto the winch, the sky let loose. The rain came down so fast that it took about 5 seconds to be soaked head to toe. The ride home took a bit longer than usual as there were downed trees and visibility was very low for about half of the trip. I guess we got lucky even thought the fishing wasn’t great! With motor issues before we left the house, we were wondering if we would ever get out fishing. Once the problem was fixed, we made the trek and got on the water a bit after 5 pm. 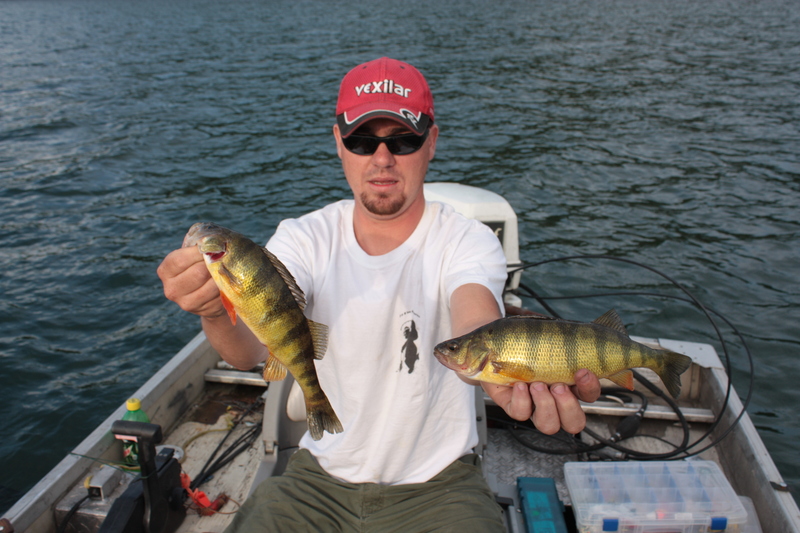 The lake was rough because of wind and numerous boaters but we weren’t pushed off because we wanted some jumbo perch! 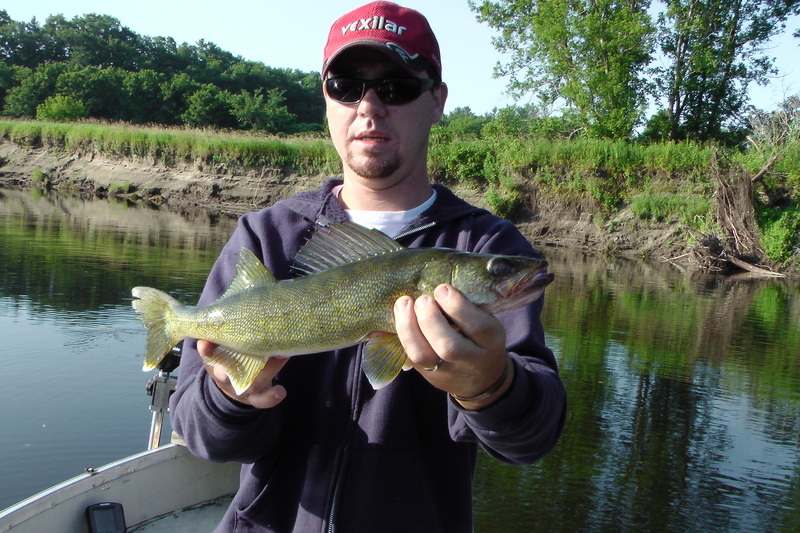 We started where the fish were biting on the last trip. We didn’t get any bites until the southern most extent of our drift. The fish had moved a bit more shallow but were still in about 20 feet of water. Each consecutive drift had the same results. 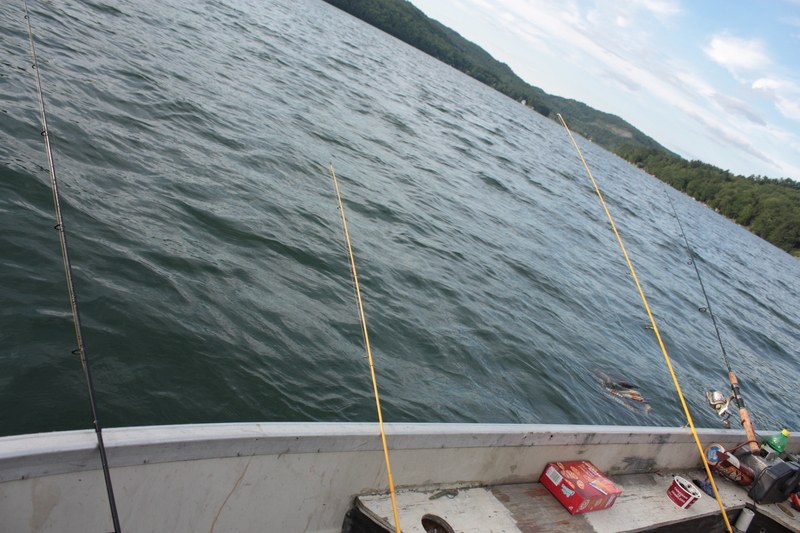 We randomly picked up fish in deep water but consistently pulled them when we hit the break. Because of the wind and waves, each drift was slightly different than the last. We had one line that produced more than others so we tried to hold as true to its course without having to use the motor. The set up was simple. We were running 1/4 ounce jig heads tipped with a piece of a crawler. 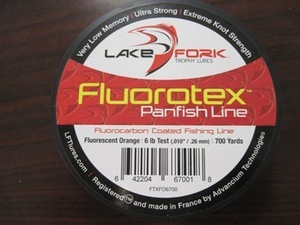 We used orange, chartreuse, and pink jigs. 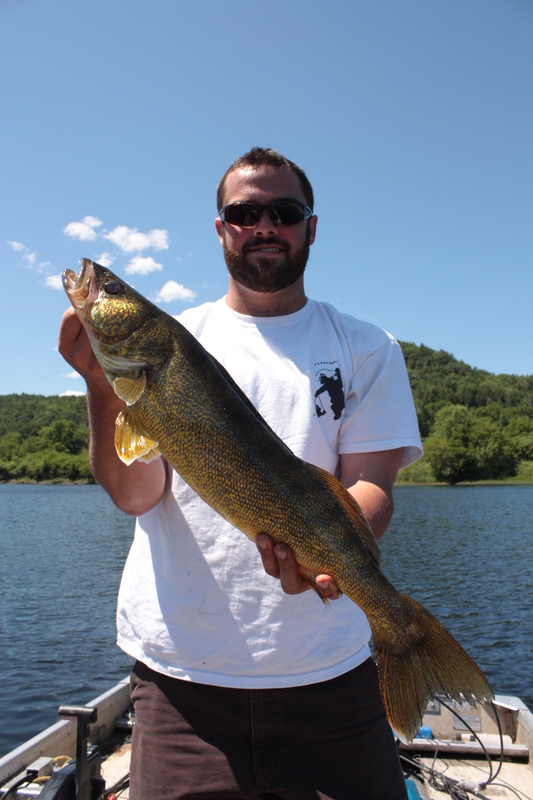 The fish didn’t seem to have a preference to one color over another as all rods fired about the same amount of times. With a strong wind we were forced to run all of our rods off of the same side of the boat but fortunately we only got tangled once but it was with three lines! 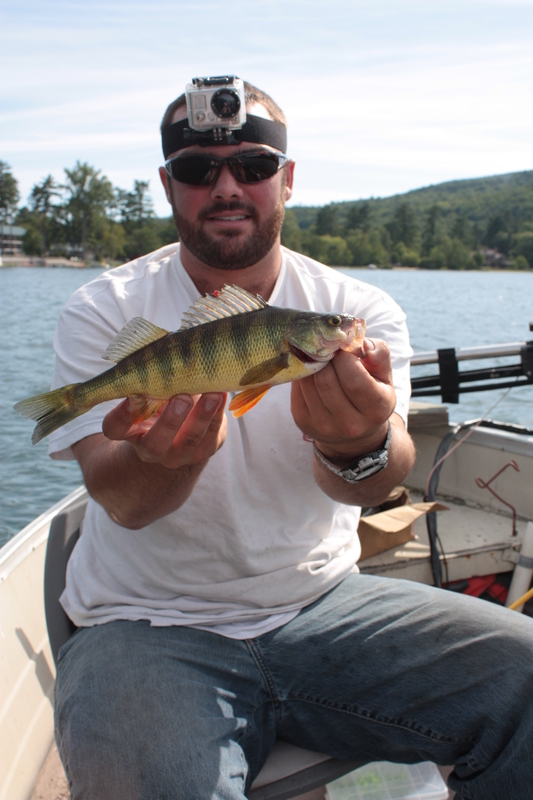 Check out our Jumbo Perch Fishing In Vermont video we made with clips from the trip. This is what the side of the boat looked like for most of the trip. We call it the “bearclaw”. First double of the day. We had two but didn’t take a picture of the second. 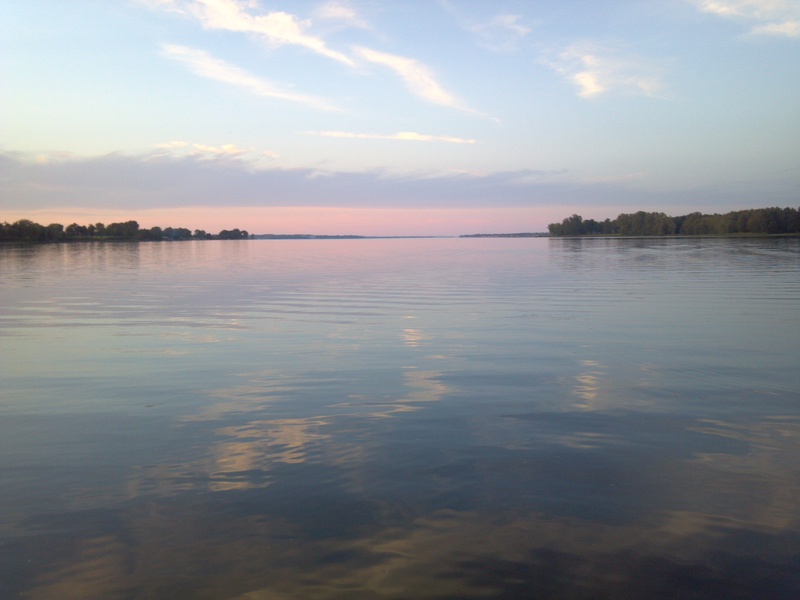 When the lake started to calm down we made a move towards shore to start casting for bass, bluegill, and pumpkinseed. 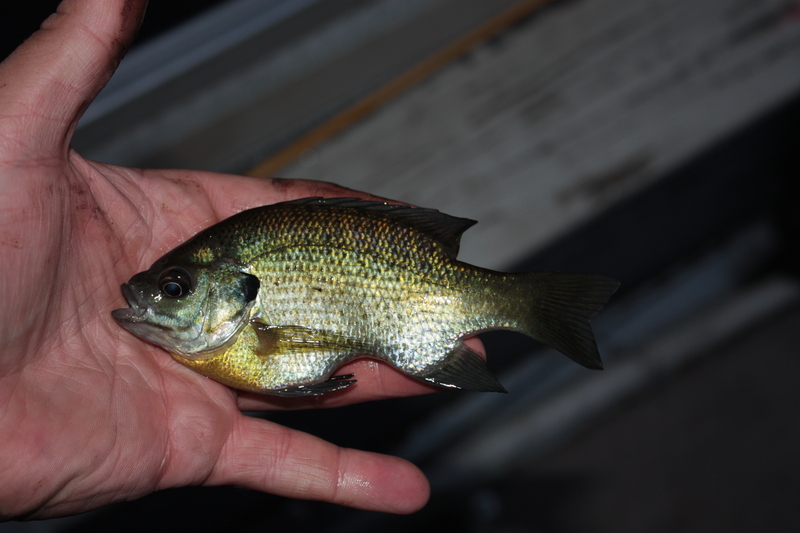 The bass weren’t very hungry as we only caught one around two pounds but the bluegill were very aggressive. 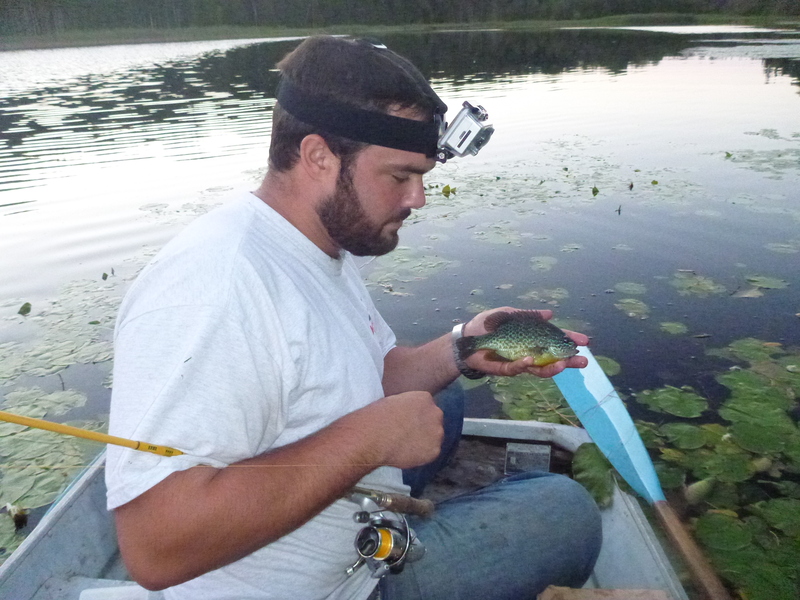 We were catching them on plastics, worms, and Heddon Baby Torpedos. 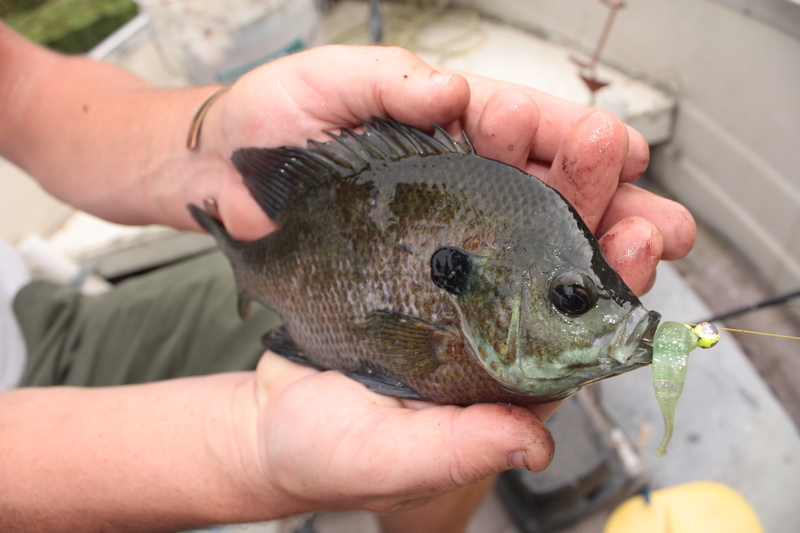 This is what I would call a survivor bluegill! If it weren’t for the constant action throughout the evening, the duration of our trip would have cut short due to the cramped space in the tiny row boat. We were fishing a small pond and for sake of gas mileage and amount of daylight left, the roof top boat made the most economical sense. 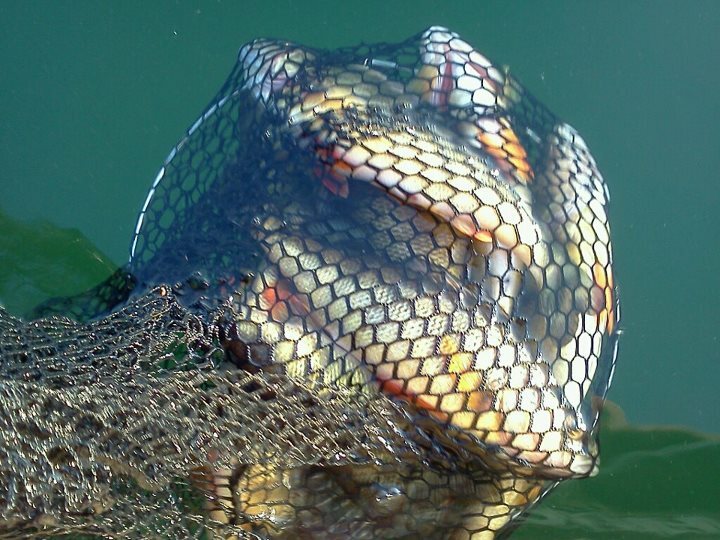 We began by casting “Live” Baby Shad by Lake Fork Trophy Lures about three feet under a bobber for perch and crappie. 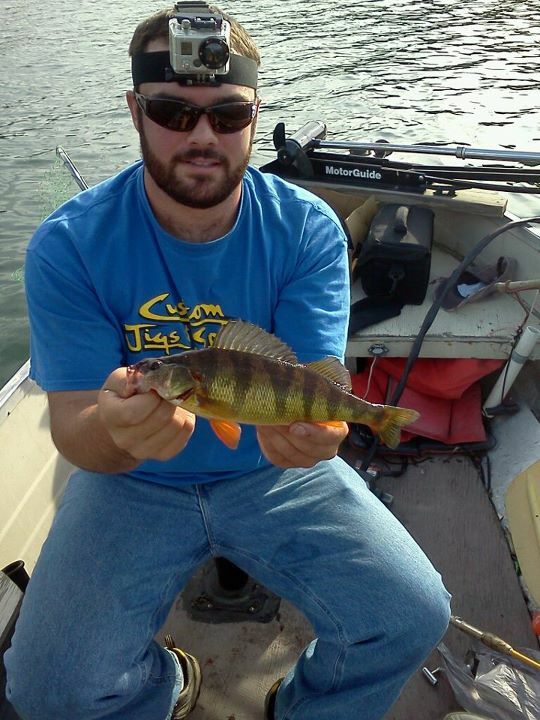 Perch were the only takers other than a 12 inch loner crappie as we fished a 7-15 foot range of water. With the air temps finally on a cooling trend after a week long heat wave, we decided to move shallow to see if the fish pattern had changed. When we got in closer to the lily pads, we started to get bites but were not able to hook up. 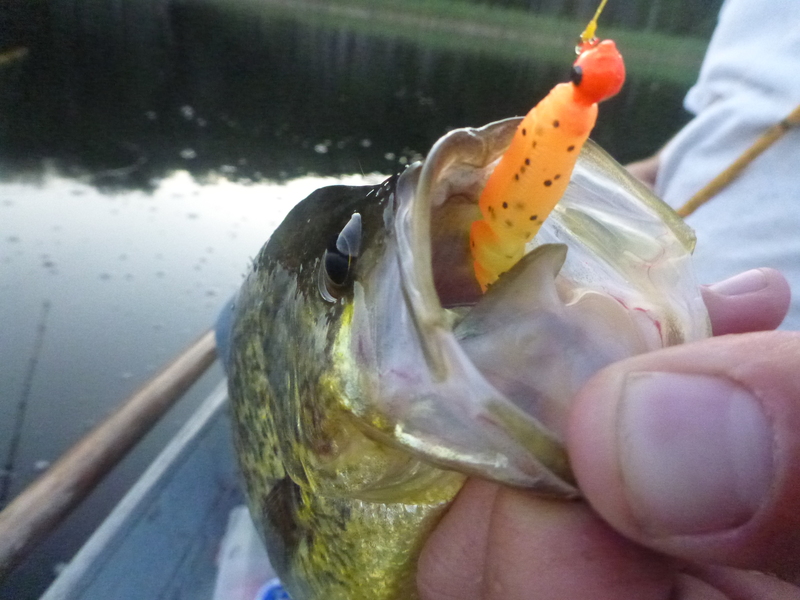 We switched to fishing a small section of a crawler or a small piece of a LBS so just the tip of the hook was covered. 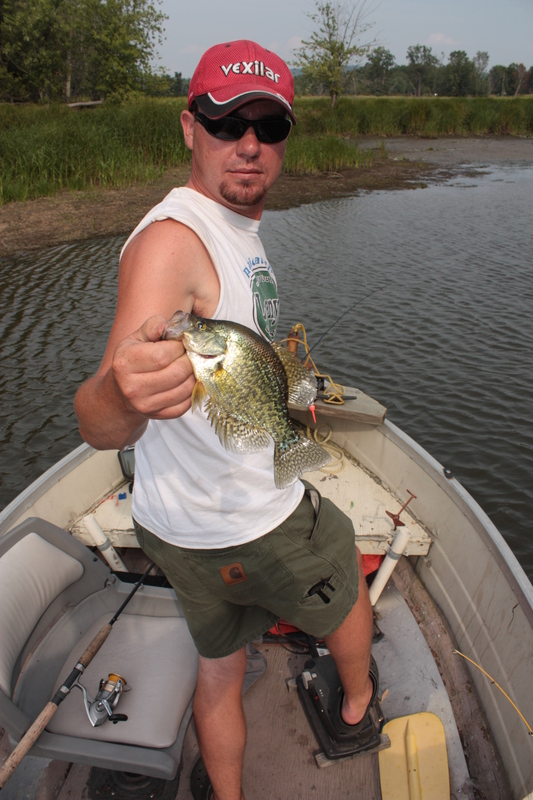 We began pulling pumpkinseed one after another. As the wind pushed us in, we got right on top of the school and our drift stopped when we floated atop the weed bed. 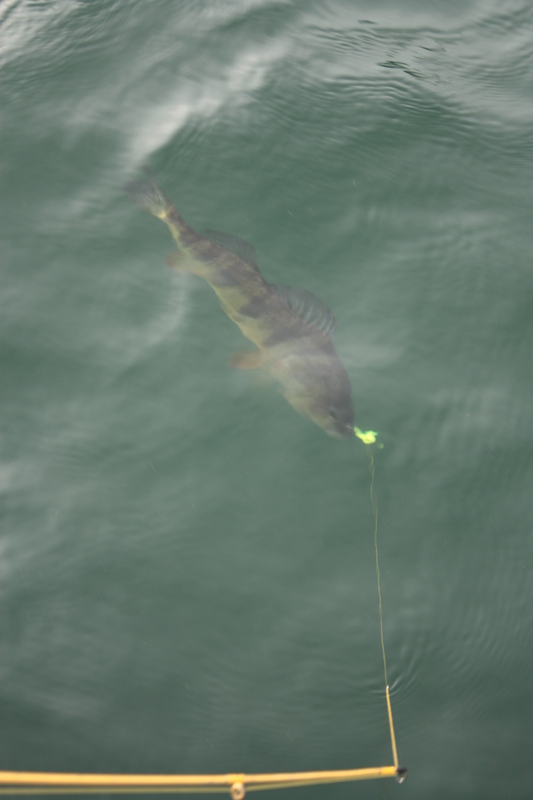 Staying in one spot, we began vertically jigging them sight fishing. 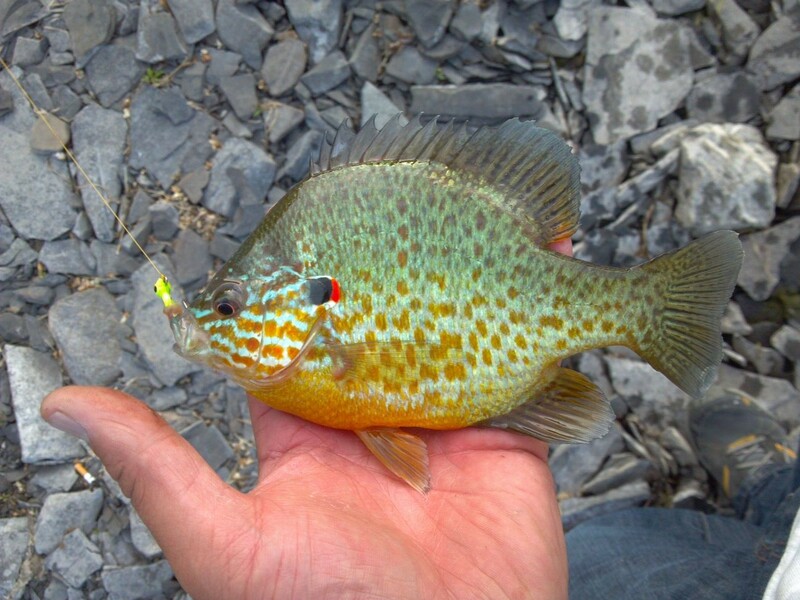 Check out the Sight Fishing Pumpkinseed video on our YouTube page. 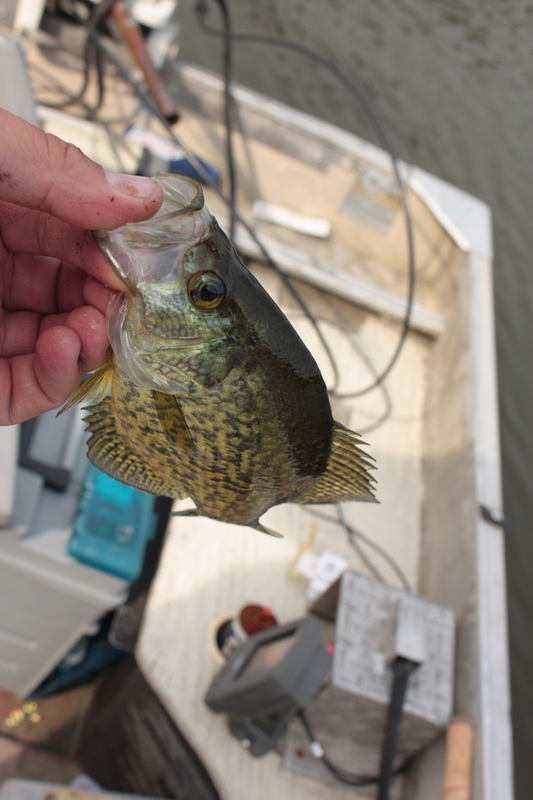 As the novelty of catching pumpkinseed wore off, we moved back out towards deeper water to see if the crappie had put their feed bags on for the evening bite. 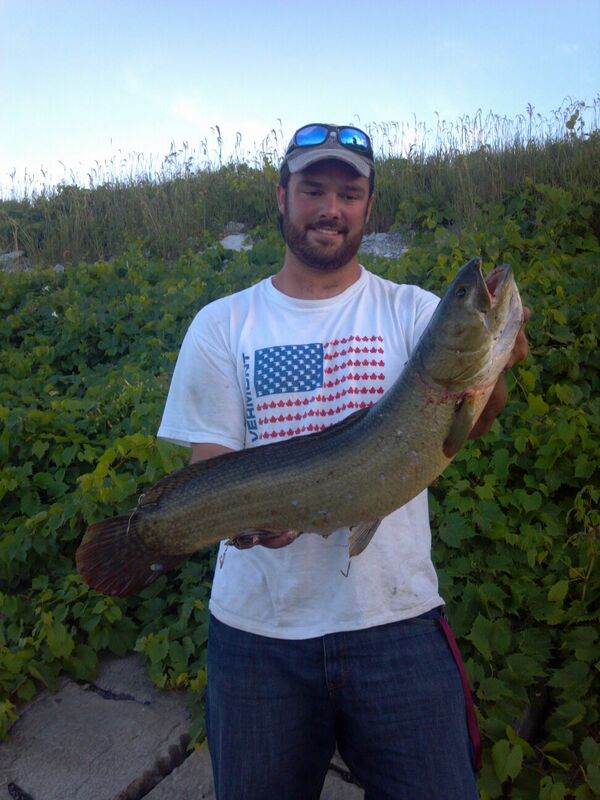 One of the first casts, bobby pulled a nice 11 inch fish which was quickly released to see if others were to follow. 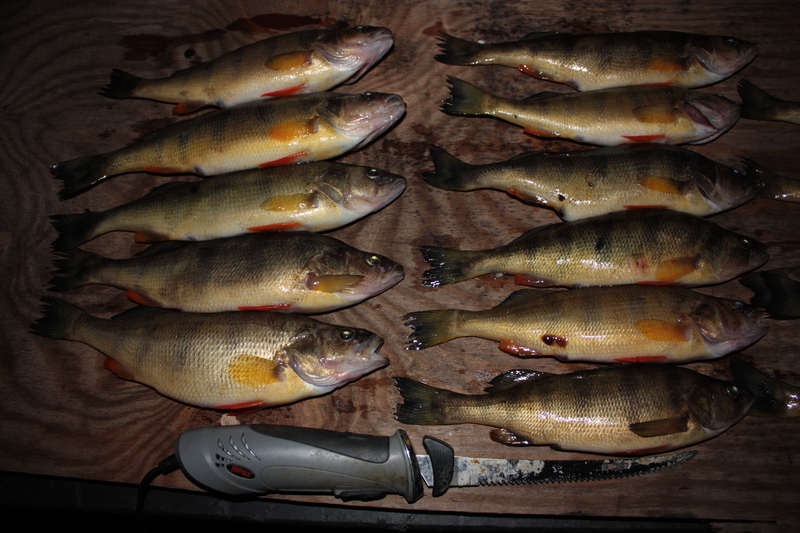 Unfortunately, the remainder of the night was filled with only perch. After running a few errands when I got out of work I was on the water around 4:30 pm. It’s been hot for about a week now and today was no exception. With temps in the high 80’s, little to no wind, and a good deal of humidity, being on the water was about the only thing I’ve been looking forward to all day! 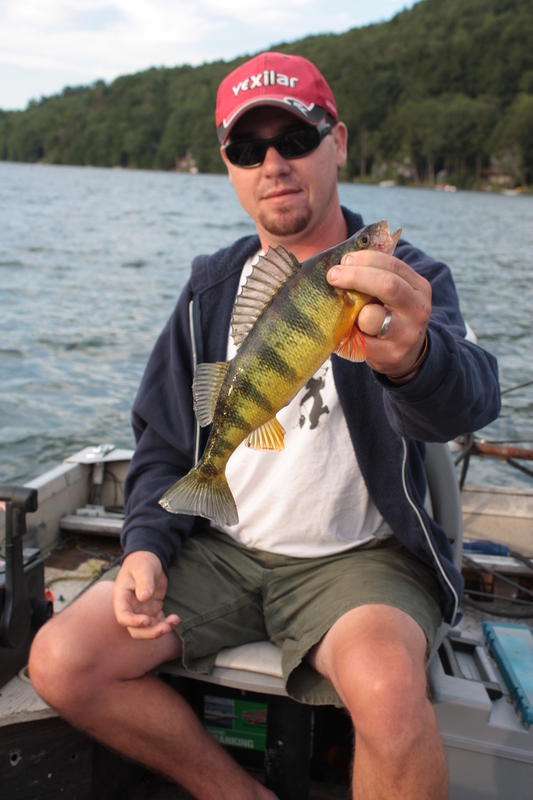 Fishing for perch that are constantly roaming the deep water basins of a lake can be frustrating if you aren’t versatile. This lake in particular is known to be very hit or miss. I choose my spots on this lake by one of two ways. My first option is to attack deep water areas with structure that I have previously located. Secondly, is to hit spots where they frequent as they roam. Today, I began with the later option. I found this spot by trolling deep diving crank baits a few years ago. I was using two presentations.The first was a white Lake Fork Trophy Lures “Live” Baby Shad on a pink – 1/4 ounce jig head made by 2 Jerk Baits. 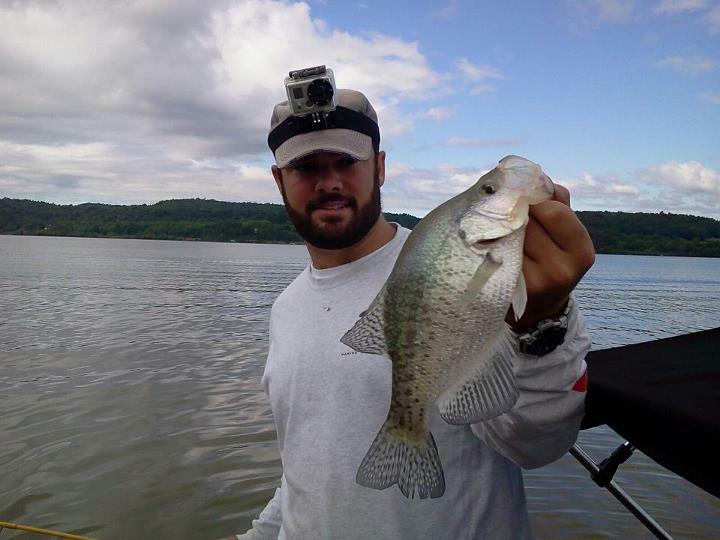 The second was just a jig head with a piece of crawler. At times I would put a tiny section of worm on the tip of the jig with the LBS. 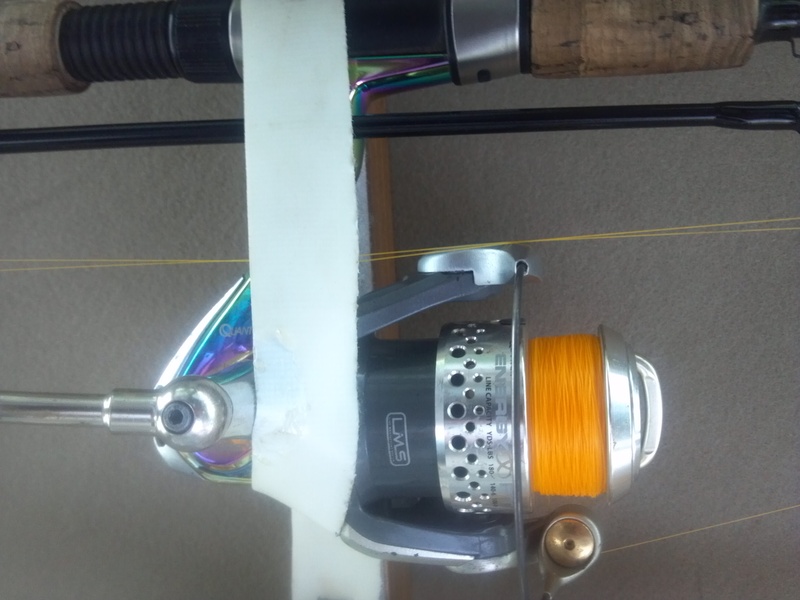 I have found this method to be effective at times when the fish are tight lipped. I also used a spoon for a portion of the day but was not getting the action I was with plastics and worms. 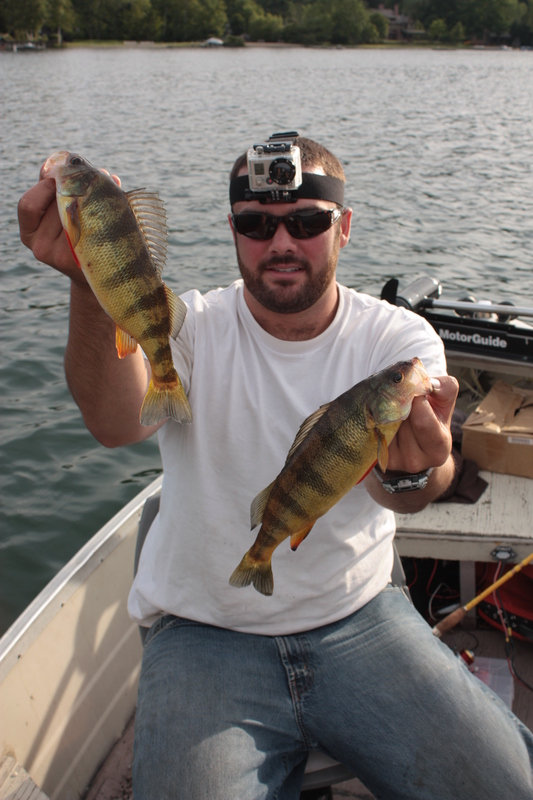 I was able to catch a bunch of perch but only by deadsticking. 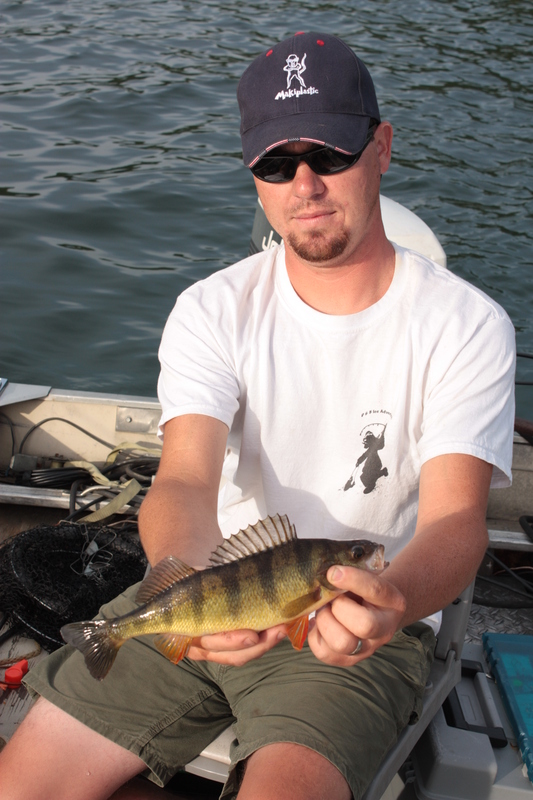 Usually, I would vigorously work the bottom six feet of the water column for these perch. Today they wanted the presentation still and suspended between six inches to a foot off the bottom. Check out the video on our YouTube page from the day!